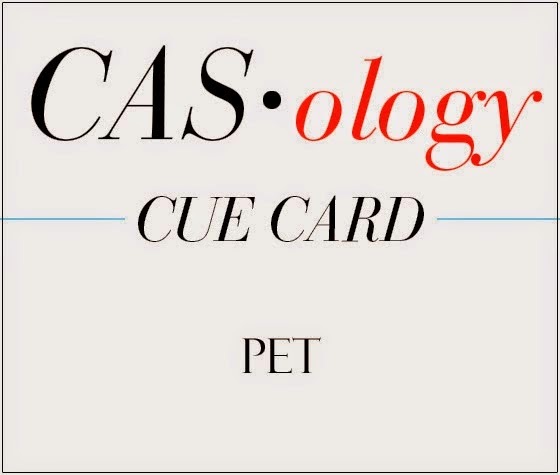 Time for a new Cue Card at CASology! Tell me what kid would love to have a pet monkey! 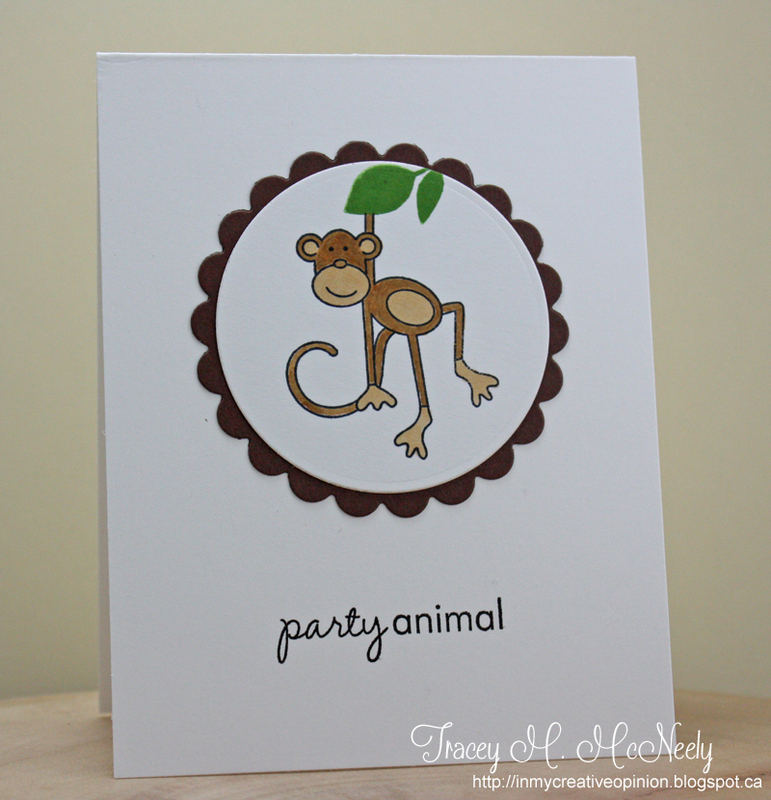 The monkey image was not hanging from anything, so on his own he seemed out of place on the card. So I stamped him on a circle and then put the brown scallop frame on the circle. Still looking a bit lost I stamped some greenery at the top of the circle, grounding the monkey image. That greenery is the perfect touch! Love reading how you came to that decision. Such a funky little monkey! Gorgeous card, as usual! 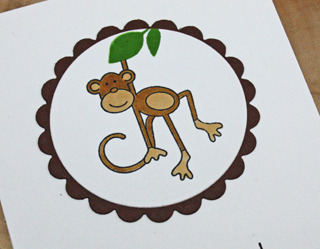 That monkey made me smile :) Darling card. This is too cute! I like the wee bit of green! I love this little monkey! Fabulous card, Tracey! Ha...I love that monkey...too fun! Love your clever take on the cue card, Tracey! Your monkey is so cute, and I love how you placed him hanging from the branch...so fun! That monkey makes me smile. He's so cute just hanging there. Super cute, and super FUN!!!!! Cheeky monkey! adorable little monkey.. cute card..
My kids had almost every kind of pet imaginable...I certainly would have drawn the line at a monkey though! Cute idea to add those little leaves at the top! Well I would love to have a monkey! haha! This is so adorable Tracey! Love how you gave him a limb to hang on too! I'm so glad you gave that monkey something to hang from! He is super cute -- what a fun card! I know I wanted one! My mother said 9 children was enough! Love seeing this older stamp ...adorable Tracey! LOL! The sentiment is perfect! My aunt had a pet monkey once. I always thought that was a little strange! So cute!!! I loveeeeee that monkey!!!!!! Awww...what a cute monkey image! So fun...love it! 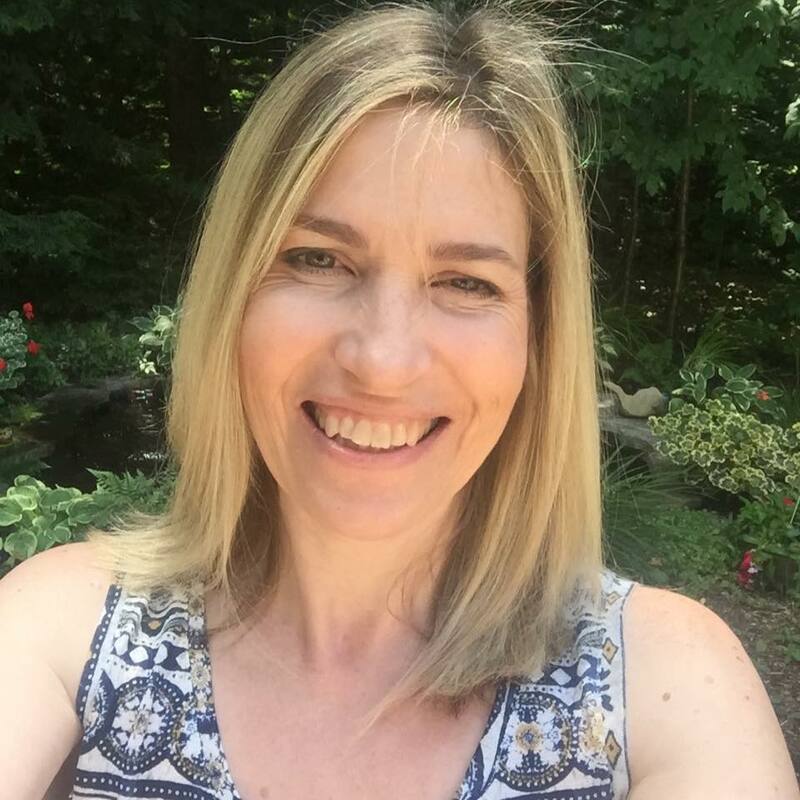 Adorable, Tracey! Love your fun monkey! Cute, cute, cute!! Thanks for sharing the process of 'grounding' your dangling monkey - that bit of greenery is perfect!! This little monkey always makes me laugh. Love how CAS this card is! You have to know I'd add some silly pun to this...Love this card!! This is just too darn cute! I love that sweet little monkey, so fun.